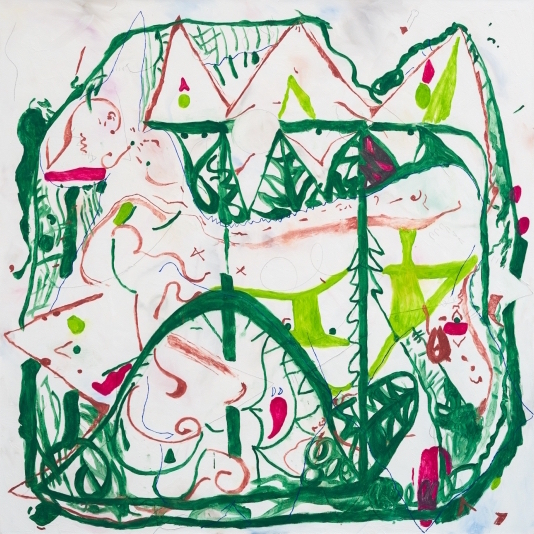 Ramos writes: "Having staked his claim with his format, ground, scale and referents, Mills’s new work is free to juggle the possibilities and delights offered with painting’s phenomenological effects. Space is stacked, folded, stretched and warped; marks, dabs, and scribbles flow, writhe and repeat themselves as if moving through time. Elements in each composition obey a felt sense of optical logic, the edge of the canvases being the most influential formal element... Mills’s work reads like transcriptions of consciousness, reactions to emerging visual structures in each painting, a result of their being based on smaller drawings. Flashes of identifiable imagery are now joined in equal measure with more direct visual sensations..."